In early fall, Vancouver-based Director and Filmmaker (and all around good friend) Nigel Edwards and I were given the opportunity to embed with the Canadian Forces Joint Task Force North division in the Kluane Mountains, Yukon Territory for Operation NANOOK. This Operation is the largest annual military training exercise in Northern Canada. Focusing on Northern sovereignty drills, search and rescue, survival and wilderness training and more, Operation NANOOK requires the combined efforts of multiple departments of the Canadian Armed Forces, from the Air Force to the Rangers and everyone in-between. 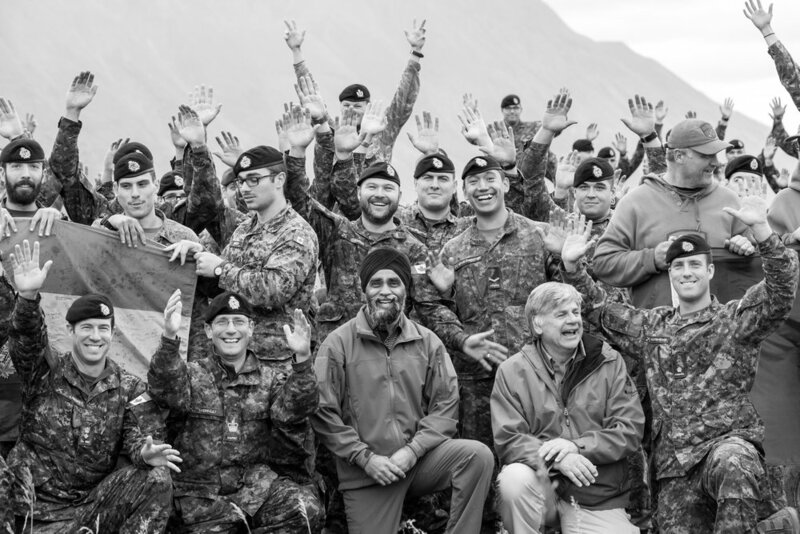 We were incredibly honoured to live, sleep, eat, and participate alongside the men and women of the Forces throughout the last week of the Operation in Haines Junction, Yukon. The following post is a photojournal: using some of my personal favourite black and white images to highlight our experience with the Forces, along with some basic short descriptions, I hope to be able to depict a different, more personal side of the Canadian Military. My full Black and White Gallery from Operation NANOOK 2016 may be found here. While on a hike up Paint Mountain near Haines Junction, Yukon, members of the 12e Régiment blindé du Canada from Valcartier, Quebec receive an emergency radio call regarding a fallen member back down the mountain. While one solider copies down geographic coordinates of the injured team member, another blocks the rain with his hat. A couple of Griffin helicopters play tag team during a search and rescue training mission between Whitehorse and Haines Junction. Each Griffin was captained by an experienced pilot along with a younger trainee. Throughout the flight the captain would constantly challenge the younger pilot, leaning into him when his answers were less than perfect. This level of mentorship was great to listen in on. Soldiers board a Chinook Helicopter at our makeshift camp outside of Haines Junction, Yukon Territory. Chinook pilots are quite an elite group in the Canadian Air Force and many soldiers were eager for a change to ride in the Chinook. This group of soldiers and Rangers was going on a brief reconnoissance mission in the Kluane Mountains. Soldiers from the 12e Régiment blindé du Canada from Valcartier, Quebec hike up Paint Mountain just outside Haines Junction, Yukon. Carrying full packs and medical supplies, this day hike helped build teamwork, as well as emergency response preparedness as emergency radio broadcasts were common throughout the day. A friendly soldier from Montreal showed me around the militarized Mercedes G Class. I snapped this photo of her with my 17mm lens as she sat in the front seat with the door open. They were on stand-by during a natural disaster response drill outside Haines Junction, YT. Capt Lynne Patterson FaceTimes with her husband and daughter from inside a Chinook Helicopter over the Kluane Mountains in western Yukon Territory. It was also Capt Patterson's first time in the Chinook and she was so excited that she wanted her family to experience this with her. Watching them was a moving experience for me too, as a photographer and filmmaker. I was able to take a quick snap of Corporal Chase Miller, an image tech with the Forces, while we were both laying down in the tall grass photographing a Chinook taking off. Image techs are known for taking great pictures, but are rarely even in photographs themselves. I thought it would be nice to get a cool shot of the people we were working most closely with-- the image techs, the combat camera folks and the public affairs officers. Divers from the Canadian Navy take a zodiac boat out to a dive site on Lake Laberge, just north of Whitehorse. The water was frigid, but of course nobody complained. Canadian Minster of National Defence Harjit Sajjan listens to a speech from a local First Nations elder in Haines Junction, Yukon. He can flown in to not only just watch but also participate in the Operation, climbing to the top of Paint Mountain with soldiers earlier in the day. Minister Sajjan is also our own Vancouver MP, so we were given a one-on-one interview with him the next morning. He's as awesome as everyone says. Minister Sajjan surprised everyone with an impromptu 21 push-ups challenge during an Operation NANOOK 2016 group photo at camp. This was moments before everyone was doing push-ups with the Minister. For more images, check out my full Black and White Gallery from Operation NANOOK 2016.